← What Would It Take To Save Europe? The most common source for long-term national debt scare stories is the CBO’s 2011 Long-Term Budget Outlook (LTBO), published in June. That report has two scenarios. In the extended-baseline scenario, which is pretty close to current law, the national debt reaches 76% of GDP in 2021 and 84% in 2035 (Table 1-2, p. 8)—bad, but not that bad. In the alternative fiscal scenario, which is intended to be more realistic (and which everyone cites for dramatic effect), the debt reaches 101% in 2021 and 187% in 2035—the latter being a level that virtually everyone would consider too high. So far this is is child’s play, since I’m just adding together numbers from different CBO tables. But we’re really interested in 2035 for now. The questions I want to answer are: first, what would the CBO’s new extended baseline say for 2035? 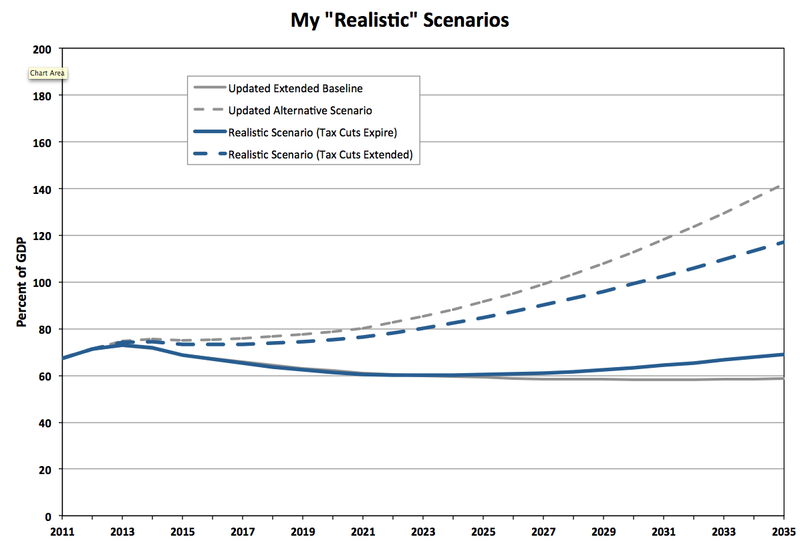 and second, what is a realistic 2035 forecast? The task here is to apply the same method used in the LTBO extended-baseline scenario to the new numbers. On the revenue side, revenues grow slowly because of real bracket creep (tax brackets are indexed for inflation, but over time average wages rise faster than inflation) and demographic trends. In the LTBO, the growth rate of revenues as a percentage of GDP from 2021 to 2035 is 0.78 percent per year (calculated from the supplemental data), so I use that in all of my projections. (That’s 0.78 percent per year, not 0.78 percentage points per year.) Under that assumption, revenues grow from 20.9% of GDP in 2021 to 23.3% in 2035. On the spending side, the LTBO breaks spending into four categories: Social Security; Medicare, Medicaid, CHIP, and exchange subsidies (most but not all health care entitlements); other noninterest spending; and net interest. There’s no reason to change the June baseline estimates for the first two categories (6.1% and 9.2% for 2035, respectively). For other noninterest spending, the LTBO approach is to assume that this category remains constant as a share of GDP except for a few adjustments that make it fall slightly between 2021 and 2035, from 8.3% to 7.8%. But because of the Budget Control Act, this category has already fallen to 7.7% by 2021, so in my spreadsheet I just leave it at 7.7% through 2035. ** Given the 2021 debt, the 2021 budget, a real interest rate of 2.7% (LTBO, p. 17), a real growth rate of 2.1% (LTBO supplemental data), and an inflation rate of 2.5% (LTBO supplemental data), you can project out future budgets. Net interest spending in 2035 turns out to be 3.0% of GDP. Total spending is 26.0% of GDP, the deficit is 2.7%, and the national debt is only 59% of GDP—smaller than it is today (and down from the 84% predicted in June). 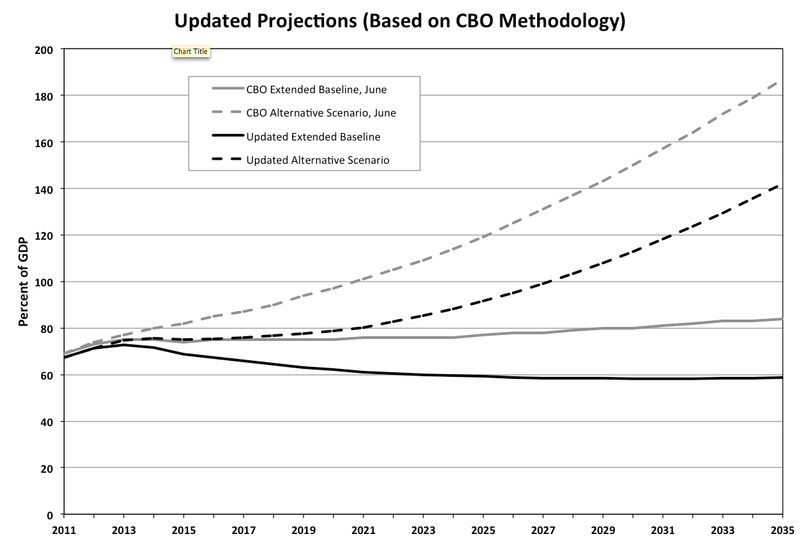 Now, everyone knows that the CBO baseline is not realistic, so it’s time for the adjustments. First we apply the uncontroversial ones: the AMT patch, the Medicare doc fix, and the more rapid drawdown of troops from Iraq and Afghanistan. As I’ve pointed out before, these basically cancel out over ten years, and the 2021 national debt stands at 60% of GDP (down from 61% in the baseline). The CBO’s alternative fiscal scenario also assumes that discretionary spending grows with GDP before 2021, rather than with inflation as in the baseline scenario. But the Budget Control Act capped discretionary spending growth below the rate of inflation. So if we assume that Congress follows the law it set for itself, then discretionary spending remains low, even in the alternative scenario. Going out to 2035, revenues are starting at a lower base (20.3% of GDP). Applying the same growth rate as in the LTBO, they grow to 22.7%. For spending, first I use the same Social Security projection as in the extended baseline. (The LTBO uses the same numbers for both scenarios.) For health care spending, I use the numbers from the LTBO’s alternative fiscal scenario—the more pessimistic ones. Other noninterest spending is where things get interesting. In 2021, this category is down to 7.1% of GDP because of the Budget Control Act (which capped discretionary spending growth below the inflation rate) and the Iraq/Afghanistan drawdown. Again, I assume this remains constant as a share of GDP (not falling slightly, as in the LTBO). With these assumptions, you get 2035 spending of 26.9% of GDP, a deficit of 4.2%, and a national debt at 69% and growing slowly. That’s with business as usual for Social Security, Medicare, Medicaid, and the health insurance exchanges. You could make a strong case that this is a problem, especially if you worry (like I do) about things like major financial crises, and the national debt should be lower than 69% of GDP. But it’s not obviously, unequivocally a national emergency. And the idea that we have to gut entitlement programs doesn’t make sense. Now, there is a big problem in this world: it’s that the rest of the government has been crippled by the Budget Control Act. By 2021, discretionary spending will be down to 5.5 percent of GDP—the lowest level since 1931. I’m not saying this is a happy outcome. I’m just saying it’s an outcome where the national debt is probably not our biggest problem—it’s the fact that we’ve eliminated almost everything except Social Security and health care programs. Of course, everything gets worse if you assume that the Bush-Obama income and estate tax cuts are made permanent, as the CBO does in its alternative fiscal scenario. In that case, the 2021 national debt is up to 76% of GDP. *** 2021 revenues are only 18.4% of GDP; growing at the same rate as above, they only make it to 20.5% by 2035. Spending is the same as above, except that since deficits are so much bigger every year between now and then, total spending (including interest) is 29.3% of GDP in 2035. The deficit is 8.7% of GDP and the national debt is 117% and growing fast. I think most people would agree that that is a big problem. 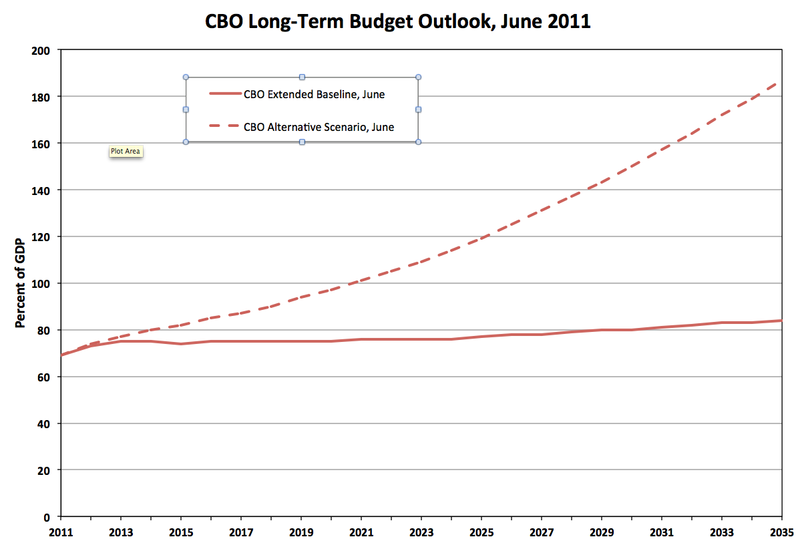 We can update the CBO’s alternative fiscal scenario, too, as I showed two figures above. It’s just the previous scenario (realistic with tax cuts), plus extending all other expiring tax cuts (which I think is a dubious assumption for reasons I won’t go into here), plus an assumption that tax revenues remain at their 2021 share of GDP indefinitely. (That is, Congress periodically cuts tax rates to compensate for a slowly expanding real tax base.) I think this assumption is gratuitously pessimistic (from a budgetary standpoint). Basically, it is an example of assuming your conclusion: if you want to conclude that we’re going to have a huge deficit problem, there’s no better trick than assuming that Congress constantly makes sure that tax revenues are too low. 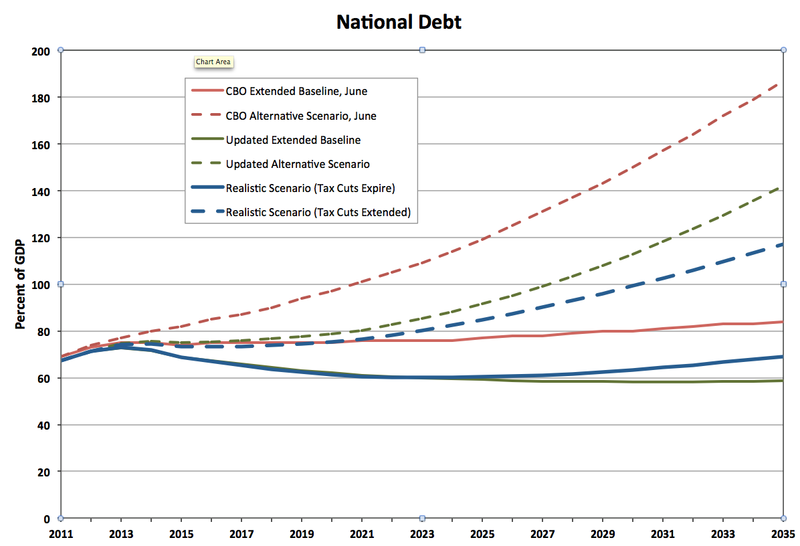 In that scenario, the national debt in 2035 is 142% of GDP and climbing rapidly. So the bottom line is: If we extend the Bush tax cuts, we have very big deficit problems over the next ten years and the next twenty-five years. If we let them expire, there is no ten-year problem. That’s the same as in my earlier post, and I don’t think that’s controversial to anyone who understands the numbers. What’s more controversial is my claim that if we let the tax cuts expire, there is a twenty-five year problem, but it’s not a huge one. Many other people argue that even if we let the tax cuts expire, we still have to cut Social Security and Medicare. On my reading, the problem is a national debt at 69% of GDP and growing steadily. If we have another financial crisis, or we start losing our status as the reserve currency, that could be a serious problem. My opinion is we should do something about it. But it’s not necessarily the end of the world. I’ve already pointed out a few places where my estimates are conservative, so I should also point out a couple of ways I could be underestimating future deficits (other than the obvious one that the tax cuts will probably be extended). Probably the biggest is that I import the CBO assumption that “other noninterest spending” will be a constant share of GDP after 2021—after it has already been slashed by the Budget Control Act. There is probably a fair chance that Congress will find a way to repeal those caps even before 2021. Another, smaller issue is that I don’t have an allowance for “other means of financing” to increase deficits after 2021. In theory OMF shouldn’t systematically increase or decrease the debt (except a little bit, since financing accounts need to grow a little as the economy grows), but maybe there’s a practical reason why it usually ends up adding to deficits. If so, can someone let me know? Of course, the interest rate and growth rate assumptions (from the CBO) could be wrong, but they both look conservative to me, especially a 2.1% real growth rate. I happen to think we do have a long-term deficit problem. I just think it may be somewhat smaller than the conventional inside-the-Beltway wisdom would have you believe. For those interested, I’ve attached my spreadsheet with all of the scenarios discussed above. It includes the CBO spreadsheets that I used as my starting point. * The BEO provides a 2021 debt estimate of 82 percent of GDP under certain alternative policies (pp. 2–3), but it uses different adjustments than the LTBO. The BEO does not include the Iraq/Afghanistan drawdown, which is included in the LTBO, and it extends fewer tax cuts than the LTBO. ** This is a conservative assumption; if I mimicked the LTBO exactly, it would fall from 7.7% to 7.4% or lower. *** This is basically the 82% figure on page 3 of the BEO, less the deficit savings from the Iraq/Afghanistan drawdown. The US can reduce its deficit fairly easily because our income taxes are far too low. From 1945 to 1980 income taxes averaged near 12% of GDP. Reagan reduced marginal tax rates so much that they fell close to 9%. Clinton increase them back to 12%; and Bush/Obama reduced them again to 9 %(and below). However, on budget expenses have remained 12%(+/-1%)) of normalized GDP throughout(except for the Reagan/Bush1 years, when they were higher) . The deficit in income taxes has been financed by borrowing, largely from the Social Security trust fund. But, not only can we no longer continue to borrow from the trust funds, we have to start paying money back as beneficiaries start relying on the trust funds. In the short term, we have to raise income taxes to 12%, simply to cover on budget expenses. In the long term, income taxes must rise above 12% in order to pay back the trust funds. Many other people argue that even if we let the tax cuts expire, we still have to cut Social Security and Medicare. But Social Security is in pretty solid shape. And the long-term problem with Medicare costs comes from the US problem of health care costs, not anything in particular about Medicare. (More detail here). The folks arguing that we need to cut “Social Security and Medicare” are hiding from the real issues with our long-term debt problem. [David]] Brooks does not want to be bothered by arithmetic. He wants his readers to support his plans for tax reform, for cutting Social Security and Medicare. In other words he wants his readers’ support for doing all the the things that David Brooks always wanted to do, but he now says that we absolutely have to do because of an economic crisis caused by the incompetence of the people who always wanted to do these things. James, great article. This is exactly the sort of intelligent perspective I need to offset the blathering of the politicians and pundits. Too bad so many of us have let ourselves become anchored in sound bites instead of actual data. “how do we turn around our unsustainable and chronic (since 1983) $10 trillion trade deficit”? Put the two questions together and the answer I get is what Dow Chemical CEO Andrew Liveris says in “Make It in America” and former Intel CEO Grove also says in a number of articles,. We must rebuild and protect our domestic manufacturing base. I think you underestimated the current debt to gdp ratio. Its not 65%, its 14.79T debt/ 14.95T gdp, which is a 98.92% starting ratio, not a 65% one. Personally I like to solve todays problems before imagineing what future ones will be like. Has everybody read “No More National Debt” by Bill Still? And if not, why not? There are small groups all over the country reading this book. Tea partiers are reading it. Leftists are reading it. Greens are reading it. Dems and Repubs are reading it. You might wish to read it, too. And if GDP somehow fails to grow at 2.9% (real), we will be OK? Because all government expenditures are indexed to GDP, right? Right?? So nothing could possibly go wrong, and anybody who draws these charts in dollars is a hyper-partisan Neanderthal. @Nemo: I don’t fully understand your point. First of all, the CBO estimates long-term growth at 2.1% real. That’s very low, even compared to the period since 1973. Except for health care, most government expenditures grow slower than GDP. Social Security grows with wages, which grow slower than GDP. Most of the rest is set in annual appropriations; over time, that stuff has gone down as a share of GDP since around 1980 (except during Bush II). @owen owens: You’re counting gross debt, not net debt. Counting gross debt is like saying that the $10 that the son owes to the daughter should be added to the family’s mortgage and credit card debts when measuring the family’s aggregate financial position. A good flat tax that eliminates accountants, a fair # of attornys, and the IRS will go long way to reducing the intentional confusion wrought by such careers, economists may find thier field a moot one once the need to profit from money goes away. Money to be saved in the Iraq/Afghan drawdown? There’s way too much money USD $$$$ in oil and drugs and the rake-off by defense contractors in these places to contemplate much of a drawdown. Perhaps Obama will *de-surge*, but too many beautiful poppies in Afghanistan, making beaucoup profits to withdraw, imo. An added benefit for the West psychopaths running this fiasco: Russians getting hooked on heroin, which needless to say weakens Russian society. Putin coming back as president is actually a real godsend for the west. Whereas western *leaders* are tough because they have backup in the form of technologically advanced hardware, Putin as a man is tough. And I believe he CLEARLY sees what’s going on with the psycho poker game being played out. Someone needs to apply brakes on these jackals, before something terribly nasty goes down. Lastly, None of these costly, draining, useless wars has anything to do with legitimate security concerns of the United States, it’s a complete hoax, facilitating unquestionably the greatest financial crime in the history of the world. Hi Owen, in place now is a “modified flat tax”. What’s needed is real progressive tax rates, where the rich would pay much more, since the rich consume a disproportionate share of the federal budget…..DOD, CIA, NSA, DHS….devotees of the rich and Wall Street…. expend most of their dough $$$$ clearing the way for US business to dominate around the globe. It’s no coincidence the first director of CIA was a Wall Street lawyer. It’s collusion at its’ finest. Therefore, they need to pony up and pay for it. When you are broke, busted, penniless, bereft of assets, on your behind, down and out, down for the count, thin in the heel, worn in the lapel, tapped-out, overdrawn, credit downgrades, a modicum of debt is impossible. Now, imagine a really big one, in the trillions, a declining tax base, a hollowed-out industrial sector, vultures sucking out wealth from every scrap, limp D* ckd pols who are bought and paid for, and this debt is LUDICROUS. James, this isn’t to demean your scholarly analytics appearing above, you did a remarkably fine job presenting the details to your readers, but, still, at the end of the day, the problem is insurmountable and hopeless. But *ideas* for job creation – okay, more interesting. Didn’t they rip up all the poppy fields in AZ, Utah and NV? So there’s a manufacturing industry that can sprout in struggling Las Vegas. Orientals love to gamble so the trip to Vegas doesn’t have to be just for weapons technology (theft or buy) trade. Geographically its ideal air transport weather for global war lords and drug lords….am I selling it yet? Less sarcasm…? Hey, anyone know if the Saudis are raising more Arabians? Vegas is good for that, also. Those abandoned mc mansions will make nice stables! Didn’t Putin send in the official Russian Army to Chechnya and lay waste to the heroin cartel in the ‘hood? Yeah, who wouldn’t like to see Obama do that in some cities in USA…? Am I right, people?!! The jackals are proud to be in service to the self-proclaimed God of Urantia. They CAN watch 4 billion people “starve and die” if for no other reason than to complement each other on proving their theory. Don’t know what their plan is for social engineering once PSYCHO HEAVEN is established – my monkey brain lacks imagination for that scenario. But once language like “starve and die” is used by the elite intellectuals, you’ve got a causus belli among the filthy animals known as “farmers”. They tend to get all pitchforky when some flim flam man from a bankster tries to take away their ability to feed themselves – so it’s a war. Pick ’em off after the harvest is in and the work is done. The 20th century cell phone wealth plan of the Congolese mercenaries – a “classic” move in every race for “survival” back in everyone’s pre-empire building history. Not sure where this greatest financial crime of all time settles in the time continuum? At best, in literature it was modernized and futurized into the Prime Directive in Star Trek series – don’t sell your weapons to anyone…. CIA plan for giving them to the *strong man* to do away with the *weak*….? I say that We the People have the right to challenge idiots…. Why just compare wild guesses? Nobody even remembers which guesses are wrong and by how much. Instead, why not discuss how much debt has increased? And how about taking a look at the growth of all of the debt, public and private? Why not? Is it much too depressing? @Steve: LOL, must is a tough nut to crack. @ Carla, start hanging around me, it’s so much fun…..my personality is why so many women have loved me…..and then left….lol. The camera photographing the exchange appeared to me to be non-broadcast quality, etc. Anyway, one good turn deserves another…I sent this vid to my sister in NYC a couple of days ago, and she liked it, and she’s older than me, and an excellent critic. Not insurmountable Whoop, doing a quick Google search I see that the top 1% hold something like $13 trillion in savings whereas our national debt is $14 trillion. A small transfer and, voila, $1 trillion to pay off. Much more manageable. I am kidding of course, but if we did some tax adjustments this whole thing gets a lot more sustainable. Another example of “assuming the conclusion” is CBO’s assumption that the real long-term interest rate will remain above the real long-term GDP growth rate. As Jamie Galbraith has pointed out this a recipe for a steadily increasing net interest burden, almost irrespective of what happens with the primary budget. Calling it *savings* should be a crime – it’s the HARVEST THEFT of labor’s fruits – done at freekin’ gunpoint – literally – with the passage of the Patriot Act….the Secretary of the Treasury has no LAW that can stop him/her from looking into YOUR *savings* and filtching the whole load to pay the mercenaries. THAT is HOW they got $13 Trillion on their books! So what about the 99%? There are definitely sub-categories, right? The koch et al paid street hooligans, the MIC mercenaries, the petty back-stabbing babushka busybodies everywhere, the RELIGIOUS RIGHT et al, the whores in D.C. AKA politicians, the technocrats who corrupted the way votes are collected and counted…that’s a lot of USA citizens who will club the *weak* to death with the media, unemployment, RELIGION, etc. They embedded themselves in ALL BIG $$$$ flow industries – health, energy, education, defense, trade and banking. And every single one of those industries is sick and dying from their insider filtching….how else do you *OWN* in savings 13 trillion? WTF is that? Delusional – but all the wannabees still *believe* they can be one of the 1%!!! At least admit you can’t be one of the 1% in a global maggot economy without a PRIVATE ARMY…. Thank you, James. But we all know these horror stories about the deficit are merely rationale for a radical ideology fixated on gutting social spending and returning us to the 19th century in terms of legal and economic policies. Deficits are high due to tax cuts, the decline in revenue resulting from the Republican/Finance induced economic calamity, the relative decline in middle class and working class incomes and this country’s inability to confront the health-care industry and force it to trim costs. Cutting back unnecessary foreign military adventures would help as well. As much as I appreciate your analytical efforts–and I know it isn’t easy–we need to point out the facts and resist the temptation to define the “problem” on the same terms as those who created it and are using it to dismantle a half a century of progressive achievement, which ended in the early 1980’s. There is only one way out of the global recession, and government must lead the way. Could you please explain how debt is a problem for a country such as ours that has monetary sovereignty? Alexander Hamilton said the national debt is a national blessing. Why are we so afraid of it? Didn’t the recession of 2000 occur because Bill Clinton balanced the budget? Shouldn’t we tax bad things (like pollution) rather than good things (like labor)? Yes, we should tax bad things like pollution and not good things like labor. Slave labor is what created pollution in the first place – slave labor being labor that has “no choice” in what is being massively created. Are you with me in *institutionalizing* those in the gene pool who aren’t capable of knowing how insane they are? Tyler, keep asking that question! None of the economists or economics writers want to answer it. Front page news in our local paper today: PNC Bank has given a big grant to the public library system in our town to start teaching Preschoolers about money. Kinda like putting the Mafia in charge of ethics education. @Peter Principle: But historically the real interest rate has been higher than the real growth rate, so I think the CBO is right there. A real interest rate of zero (what we have now, roughly), is a historical anomaly. @Tyler: I agree with taxing pollution. What Hamilton said about the debt is open to debate. On the one hand, he said the federal government should assume state debt. On the other hand, he created a bunch of new taxes so that we could pay off the debt. Controlling the global reserve currency certainly makes it easier to finance large deficits, but I don’t think we can assume that the dollar will have that status forever. The federal government does not “finance” deficits. It does not need to tax or to borrow (i.e. issue T-securities). If there were no T-securities, the ability of the federal government to spend would not be reduced by even one penny. What I would like to see is a chart of previous projections vs. the reality. How much credence should be put in such long term projections, anyway? KWAK, DEBT IS DEBT IS DEBT! 10/18/2011, US TREASURY DEBT SUBJECT TO THE LIMIT (I ASSUME YOU HAVE TO COUNT THIS), TABLE III-C DAILY TREASURY STATEMENT, TOTAL DEBT $14,942,751,000,000. EVEN YOU CAN SEE THE DIFFERENCE COMES TO $70,049,000,000. THE BOND ISSUANCE COMING THIS WEEK, 10/19/2011, 2,5, AND 7 YEAR TOTAL $99,000,000,000. AS YOU CAN SEE WE WILL BE OVER 100% TO GDP SHORTLY. WHY IN THW WORLD DO YOU CONTINUE TO MASSAGE THESE NUMBERS TO MAKE A FALSE POINT? ?